Capable and flexible four-star located in the lush green Corstorphine district, west of the city centre. Enjoying close proximity to Edinburgh Zoo, the luxury of an indoor heated swimming pool and easy access to and from Edinburgh Airport makes this cool and efficient modern hotel ideal for quick getaways to Scotland’s illustrious capital. The Holiday Inn can be found in the leafy and affluent Edinburgh district of Corstorphine, just 3 miles from Edinburgh Airport and Edinburgh City Centre and practically located on the A8 road. Guests are invited to leave their car in the hotel’s complimentary car park and hop on a local 24-hour bus for a short journey into Edinburgh. The 303 guest rooms come equipped with cable / satellite tv, in-room movies and high-speed wireless internet access with the luxury of en-suite bathrooms. Connecting rooms are available for families with young children and all rooms benefit from guest-controlled air conditioning. 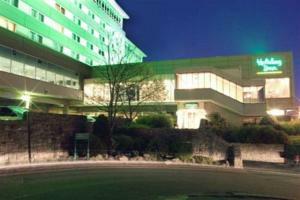 The hotel offers a range of executive suites and meeting rooms with fifth floor views. The 16 meeting rooms at the Holiday Inn Edinburgh Corstorphine are fitted out with a variety of cutting edge audio visual equipment including DVD players, LCD projectors, laser discs, modem lines, whiteboards and overhead projectors. The lush green Corstorphine district was originally a separate village to the West of Edinburgh City Centre but is now one of the most charming suburbs of the city. The village has several well-preserved medieval churches as some terrific eateries and boutique shops.